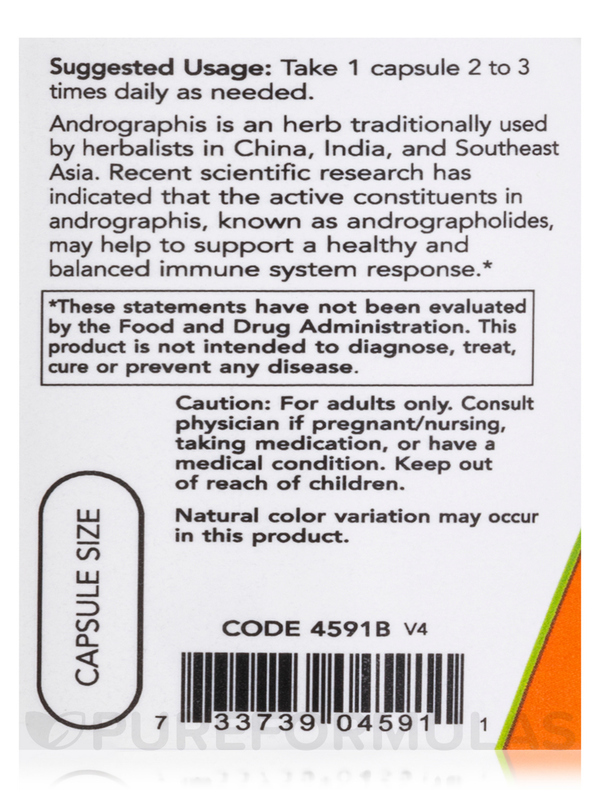 I have used Andrographis Extract by NOW for years with success! I have been using NOW Foods Andrographis Extract along with some other immune supporting herbs to try and resolve an ongoing sinus issue. Andrographis Extract 400 mg by NOW is part of my Lyme protocol and this specific brand ND prescribed. I can't yet speak to long term effects but I haven't had any issues with it (reactions, etc). PureFormulas , as usual, has the best price. Andrographis is an herb traditionally used by herbalists in China‚ India‚ and Southeast Asia. 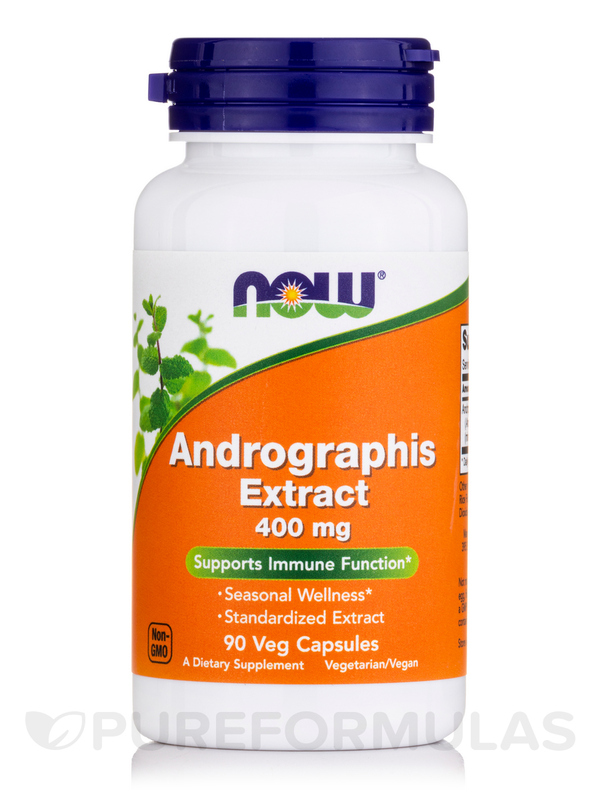 Recent scientific research has indicated that the active constituents in Andrographis‚ known as andrographolides‚ may help to support a healthy and balanced immune system response. Other Ingredients: Cellulose (capsule)‚ Rice Flour‚ Stearate Acid (vegetable source) and Silica. Not manufactured with yeast‚ wheat‚ gluten‚ soy‚ milk‚ egg‚ fish‚ shellfish or tree nut ingredients. Produced in a facility GMP facility that processes other ingredients containing these allergens. Allergen Caution: Product not manufactured with yeast‚ wheat‚ gluten‚ soy‚ milk‚ egg‚ fish‚ shellfish or tree nut ingredients. Produced in a facility GMP facility that processes other ingredients containing these allergens. Keeps me healthy & shortens colds. I ordered Andrographis Extract by NOW Foods because I work around children every day and children means germs everywhere! 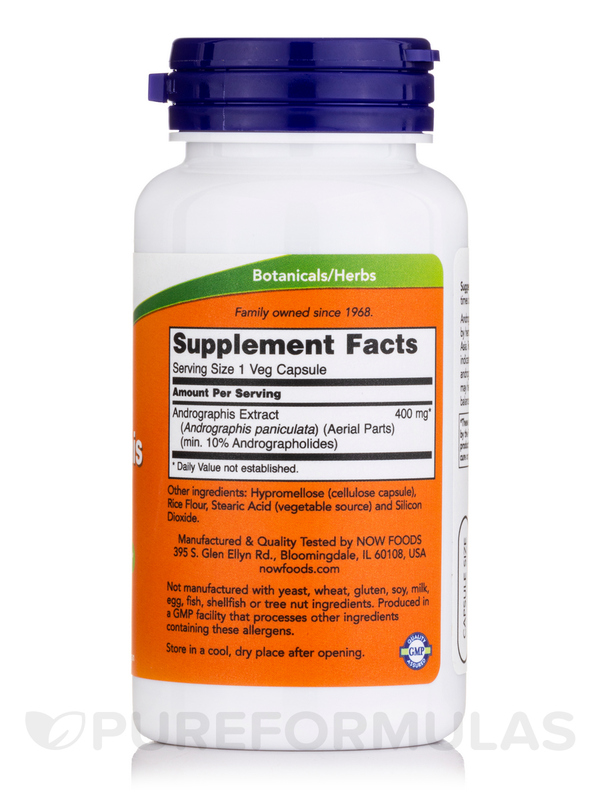 I take Andrographis daily to boost my immune system and prevent those germs from making me sick. I believe 2 capsules a day will keep the doctor away. Sometimes colds are unavoidable. 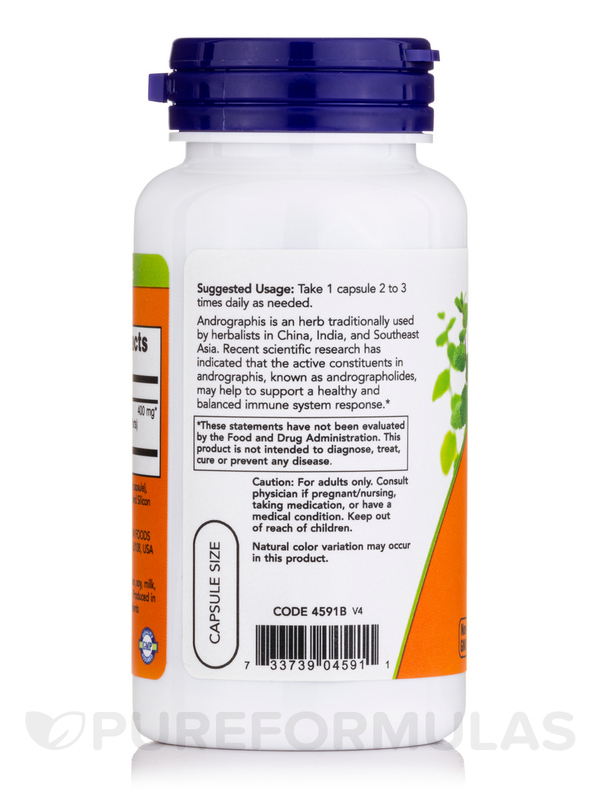 In this case, I have found that 2 capsules, 3 times a day, will shorten cold symptoms than not taking Andrographis at all. This product was recommended to me by a family member who always seemed to get sick due to their weak immune system. I decided to try it out to prevent being sick. I will order this product again. I live by it! Easy to swallow gel like capsules. They are vegetarian. Take with a full glass of water. If you don't, your burps will taste funny. 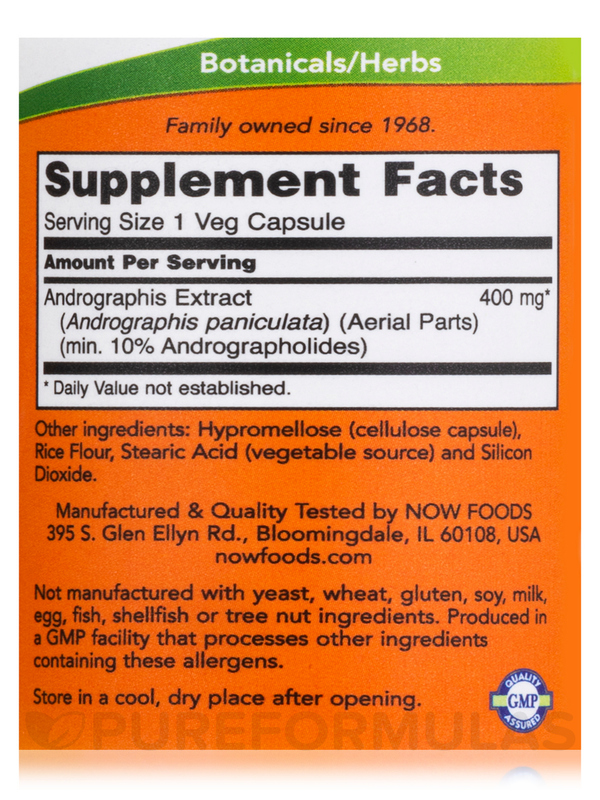 Andrographis Extract by NOW Foods seems to help with my arthritis a bit. Added to boswelia it helps more. ...Andrographis Extract by NOW. As a RA sufferer, I am always seeking new products to add to my natural meds arsenal. I have not been taking Andrographis Extract very long, but I've read nothing but good feedback about it. So far I've had no adverse effects from taking andrographis, and believe it is possibly helping with frequent swelling in my right foot. I am please with NOW products and have been using them for over a decade. Great product for gut relief! Using the Adrographis as part of the healing lymes protocol from Stephen Harrod Buhner. A good product great price and fast shipping. I will continue to use this for the 8-12 month period possibly alternating with the Himalayan Health Andrographis that comes in caplet form. So far so good. Weather here in Asheville North Carolina will be bellow 30 degrees tomorrow and i continue to go without “flare-up”. Will let those interested know how the overall protocol I will post in later and give my final experiences with the supplemental brands chosen. Cost. Great brand at needed mg.